We did it! We started a coding club after school! After having so much fun with the Hour of Code in December, two 4th grade teachers and I decided to take the plunge. I made a quick video to tell the kids about the opportunity and had applications in the library for those who were intersted. 24 kids brough back the applications and met with us on Tuesday. 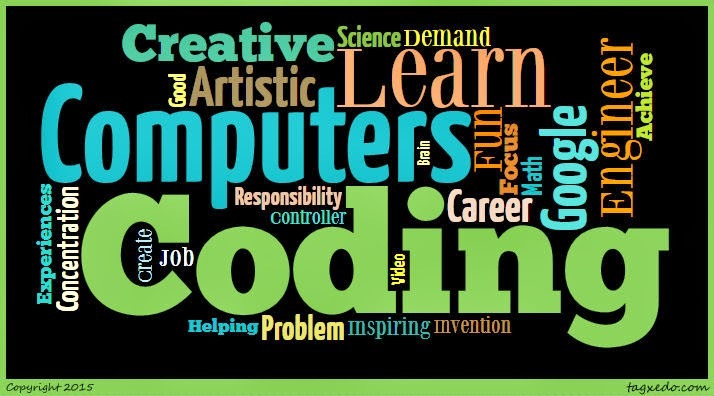 It is about 5 minutes and has lots of different people talking about coding and how they became interested in it and what they have done with it. What do you think computer science and coding are about? Why did you want to be in this club? How could this help you in the future? We asked them to share out when they were done. We typed their answers into a Word document as they were sharing out and then used Tagxedo to make a Word Cloud as sort of a logo for our club. We will be meeting every other Tuesday for 45 minutes after school. At the next meeting we will get started coding. We are thinking of using the coding tutorials at Code.org or the resources for the Scratch app . Will let you know what we decide and how it goes.